Make A Scene is the big gay film club! We started in Manchester in 2016 playing camp classics and lgbt cinema to friends of Dorothy and their friends and now we're all over the UK and our podcast is taking our queered take on film, TV and pop culture into people's ears around the whole world! 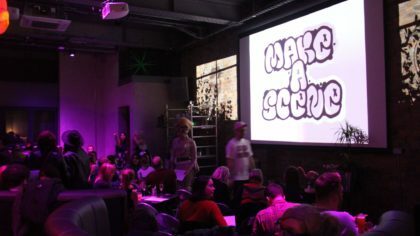 Our live events are all cocktails, drag queens, hilarious hosts, audience participation and invention that make our famous Way Too Interactive Showings so popular and we've been packing out screening since our first event - a Flower Arrange A Long Sing A Long Little Shop of Horrors. If you wanna book us for your party, film festival or event then get in touch too!